Talan is two! I can't believe it's been two years since he was born. 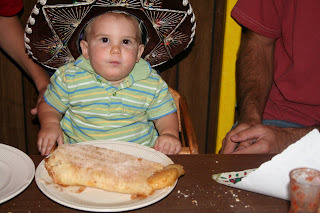 To celebrate, we took him to the El Rancho for a double birthday party with Aunt Rissa. He got to wear the birthday sombrero and eat fried ice cream (which he loved)! We also had a family party with a "choo-choo" cake. Talan had a blast with his grandparents, Aunt Anita and Uncle John, Elise and Denis, Jeremy and Morgan, Aunt Tete, and Sofia. He got so many cool presents, like a tricycle, helmet, books, shirts, a truck, a ball, a doctor kit, and alphabet letters and cards. Talan is lucky to have such a wonderful family! I was at the birthday party in spirit!!! Talan, I won't miss next year, promise! Happy Birthday Talan! Looks like fun! I'm glad too that you are still pregnant. The titles to each post crack me up...its like the "Friends" episodes right? Happy Birthday Talan! I can't believe it's been 2 years either! And, Kim you're still pregnant! Hooray! We have the same tricycle....and the same Crocs! Looks like we have the same taste...want to be best friends? Okay.